Wakefield Bridge spans the River Calder; above its central span rises the chantry chapel of Saint Mary the Virgin. Prout visited Wakefield in his tour to Yorkshire and Scotland of 1818. 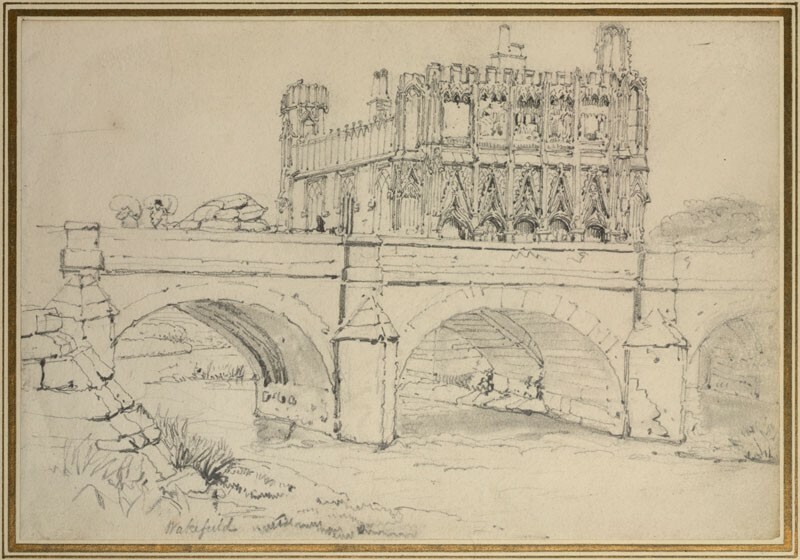 The drawing was first catalogued in the Teaching Collection in 1871, as no. 30 B in the Educational Series and, although re-numbered as no. 55 in 1874, it remained in Case III, 'Illustrations of Northern Gothic, with its Resultant Art'. 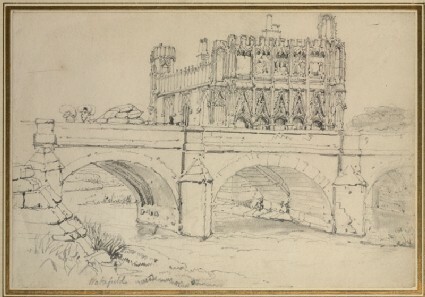 It was framed with another Prout drawing of the chapel, and immediately followed his drawing of York Minster: Ruskin described all three works in his instructions on using the Educational Series as 'characteristic English Gothic, when it separated itself from German and French' (Educational Catalogue, 1st ed., p. 38; 2nd ed., p. 37). Ruskin gave a detailed description of his reasons for admiring Prout's work in the "Notes on Prout and Hunt" which he composed to accompany an exhibition of the artists' work at the Fine Art Society in 1879-1880. He stated that Prout possessed 'a genius as earnest as it was humble, doing work not in its essence romantic at all; but, on the contrary, the only quite useful, faithful, and evermore serviceable work that the [Old Water-Colour] Society - by hand of any of its members - had ever done, or could ever, in that phase of its existence, do' (§ 29 = XIV.391). Prout's work delighted in the dilapidated and the old, and in portraying it rather than trying to produce a narrative or evoke sentiment; it was 'painting - as mere painting' (§ 27 = XIV.389), focussing on the art of depiction in its own right (cf. The Eagle's Nest, § 87 = XXII.185; and Samuel Prout, § 11 = XII.313-314, where the much younger Ruskin praised Prout's depictions of the picturesque; likewise in The Elements of Drawing, § 257 = XV.221-222). Prout's work was, importantly unaffected. Like Turner, Bewick and William Henry Hunt, Prout could draw the poor, but not the rich - because he seldom drew active figures. 'He understood, and we do not, the meaning of the word "quiet"' (§ 42 = XIV.402). Ruskin also praised Prout's abilities as a consummate draughtsman: 'Prout is not a colourist, nor in any extended or complete sense of the word a painter. He is essentially a draughtsman with the lead pencil .... And the chief art-virtue of the pieces here exhibited is the intellectual abstraction which represents many features of things with a few lines.' (§ 31 = XIV.392.) In his 1872 lecture on contentment in science in art, Ruskin noted that this 'imperfect' style was ideally suited to Prout's dilapidated subject-matter: a more refined execution would only have exposed the subjects' imperfections (The Eagle's Nest, § 87 = XXII.185-186). But Prout was also 'the only one of our artists who entirely shared Turner's sense of magnitude, as the sign of past human effort or of natural force' (§ 39 = XIV.399) - a quality sadly lacking in contemporary artists and their audiences. This was a sign of Prout's character: 'The quiet and calm feeling of reverence for this kind of power, and the accurate habit of rendering it ... are always connected, so far as I have observed, with some parallel justice in the estimate of spiritual order and power in human life and its laws' (§ 41 = XIV.401). Related to this was Prout’s 'greatness in composition', his ability to arrange his works according to 'an order only the more elevated because unobtrusive' (Samuel Prout, § 10 = XII.312-313); The Two Paths, § 60 = XVI.302) - and so Ruskin referred to his writings frequently in "The Elements of Drawing"
Prout was also significant for having recorded many buildings before they were pulled down or destroyed by restoration (Samuel Prout, §§ 7 & 12 = XII.310-311 & 314-315; cf. Pre-Raphaelitism, § 26 = XII.362) and The Two Paths, § 60 = XVI.301): 'The works of Prout [...] will become to memorials the most precious of the things that have been; to their technical value, however great, will be added the far higher interest of faithful and fond records of a strange and unreturning era of history' (Samuel Prout, § 12 = XII.314-315). 30 B The chapel on the bridge of Wakefield . Pencil drawing. (Prout). 56. The Chapel on the bridge of Wakefield. Pencil drawing. (Prout).